Nearly 100,000 soldiers are taking part in massive 10-day military exercises across Venezuela, which were staged to counter an alleged US threat. It follows Washington’s decision to impose new sanctions against Venezuelan officials last week. Lopez added that the US sanctions are an “imminent danger for us,” which is why the nation’s army must be ready to fight for its independence. 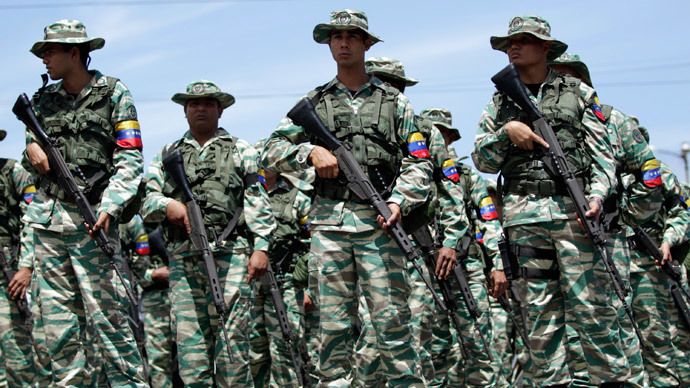 Most of the maneuvers will be carried out south of Caracas. The rest will take place in Venezuela’s oil-producing areas, such as the Caribbean coast. The nation’s army will also be testing its air defenses and anti-aircraft systems, ensuring they are ready to be deployed. The military exercises are due to show off Chinese amphibian weapons, Russian-built missiles, and other military hardware. “The insolent boot of imperialism dared touch the sacred land of Venezuela, that day if we had to fight for the dignity of our country, we would do it for peace and for the sovereignty and the integrity [of the country],” he added. American-Venezuelan relations hit a new low last week, after US President Barack Obama signed and issued an executive order imposing sanctions against Venezuelan officials who allegedly participated in human rights abuses. He also declared the country a threat to US national security. In response, Maduro has accused the US of trying to “defeat” and “intervene in” his government. The Union of South American Nations (UNASUR) rejected Washington's move on Saturday. Relations between Washington and Caracas have been tense since Venezuela's iconic former leader, Hugo Chavez, came to power in 2000. The two have not had full diplomatic representation since 2008. Maduro has also been asking his government to review and reduce the number of US diplomatic staff in the country, following allegations of “conspiratorial meetings” against Venezuela. In February, Maduro accused the US of being behind the attempted coup in Venezuela, pointing to US Vice President Joe Biden as the mastermind. “The northern imperial power has entered a dangerous phase of desperation, going to talk to the continent’s governments to announce the overthrow of my government. And I accuse Vice President Joe Biden of this,” Maduro said. The Venezuelan government had been with dealing with massive unrest amid protests called by opposition leaders. The US has accused Maduro’s government of heavy-handedly quelling the opposition. In turn, Maduro last month announced that Venezuela successfully defeated the alleged US-sponsored coup, adding that an attack on the presidential palace or another top target was planned.